My wife and I found Thailand to be a beautiful and special place. It was a lot of fun to explore a place with such a foreign culture and language. Although you could be somewhat disoriented in such a place, the people of Thailand made us feel at ease by being incredibly nice, warm and friendly. It was amazing to visit such a unique place. Getting there is an experience itself. We used several years’ worth of frequent flyer miles to get business class tickets for the 32-hour journey. We took KoreanAir from Atlanta through San Francisco and Seoul, before finally making it to Bangkok. The service during the trip was impeccable and better than the service you get on most other airlines. Our only other experience with business class on a long haul has been with Delta to Europe, and although KoreanAir is great, we actually thought the amenities on Delta were just a little better. We arrived in Bangkok around midnight local time and we hopped in a cab to our hotel. An important note is not to commit to locals inside the airport trying to sell you a ride. Simply go outside and get the cab yourself. There are many ATM’s right in the airport where you can get cash for the ride to your hotel. Part of the reason we went to Thailand was for a meeting. One of the conference hotels was the Oriental Hotel. We had read that it was one of the best hotels in the world, and we would have to agree with that. The service was amazing and there were a lot of amenities even in the less expensive rooms. There was a large marble bathroom with separate tub and shower, a Bose wave radio with separate speakers in the bathroom, a nice large desk and fresh &quot;exotic&quot; fruit was provided daily. The room was about $220 per day and while that may not seem too expensive it is VERY expensive for Thailand. It is not uncommon to find nice rooms on Khao San Road or in the countryside for $20. The hotel is not in the center of the city but is on the river and it was very easy to get a river taxi, regular taxi or to hop on the public river boats. 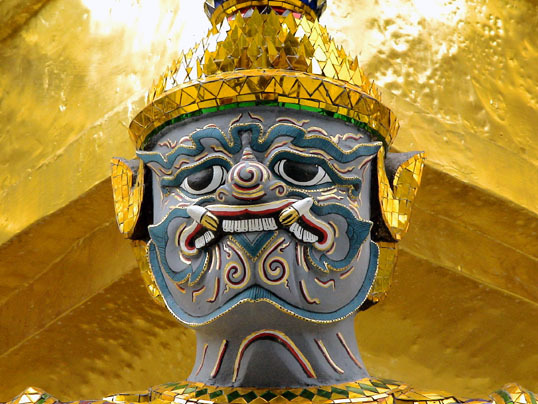 We used the Lonely Planet guide to Thailand and thought it was invaluable. It does an excellent job of explaining the difference in cultures, behaviors and customs. It describes the countryside and also is detailed enough for Bangkok. 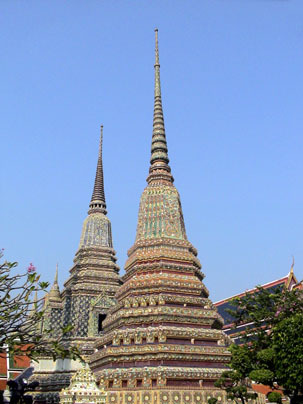 In Bangkok, it helped us decide which Wats (temples) to see and gave several walking tours which provided a great overview of the city. We thought the walking tour of Chinatown was especially interesting. The book also explained about the &quot;touts&quot; who were ubiquitous and try to scam you. Once you learn and use the word for no in Thai &quot;mai chai krap&quot; they generally go away. It also describes things you will need before you leave like hepatitis A and typhoid vaccines and electric plug converters. The food of Thailand was one of the best parts of the trip. There was a lot of information in the Lonely Planet guide. We thought that most of the restaurant recommendations in Bangkok were great! One particularly good restaurant was Somboon Seafood. 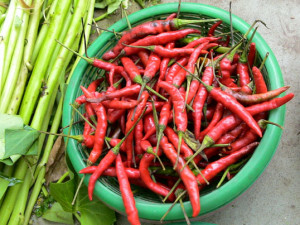 We thought the best food experience however, was found at street side vendors. Most street vendors speak little to no English but they are very nice. We learned how to ask for the basic dishes from the guidebook and did a lot of pointing. Usually just smiling and trying to use a few Thai words were enough to get something really good. Just be adventurous and try whatever they give you. We were almost always happy with what we got. Another nice thing was that the city of Bangkok is no smoking! If a restaurant has air-conditioning, you are not permitted to smoke inside. How cool is that? We spent our first 4 days in Bangkok for the meeting and did a lot of exploring in the city. We would suggest staying 2 days but not more. The temples, streets and people are not to be missed but to quote the song &quot;…once you’ve seen one crowded, stinking, polluted city…&quot; you get the point. After the meeting we took a Thai Air flight from Bangkok to Phuket (poo-ket) to meet up with our liveaboard boat the Faah Yai. We had heard a lot about Phuket and most of it was bad, so we decided to spend just one night there before we got on the boat. We stayed at Mom Tri’s Boathouse in Kata, which is a small town on the island of Phuket. The Boathouse was very nice with a beautiful beach and great service. The restaurant was excellent! They are well known for their wine selection and we had a very nice bottle of wine with a delicious 4 course dinner. It was expensive for Thailand but less than the price in the US. Kata is most certainly the place we would stay while on Phuket. It isn’t nearly as crowded as the main town of Patong, or the town of Karon. 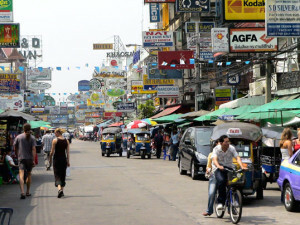 Patong is overcrowded and filled with little touristy shops. We rented a scooter for a day to explore the island and it was a fun way to see the rest of the island before we boarded the boat. 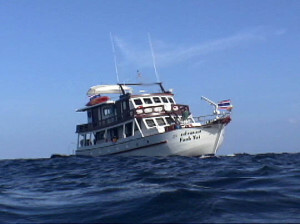 We found the Faah Yai liveaboard by searching on scubadiving.com and booked it through Siam Dive ‘n Sail. John and Bent (that’s really his name) are liveaboard brokers for Thailand. They were very nice and took care of all necessary arrangements. We would certainly use them again. Their website has a lot of information and they responded to e-mails and questions quickly. They took care of picking us up from our hotel and taking us to the boat without a hitch. The Faah Yai, which means &quot;Big Sky&quot; is an 85ft liveaboard dive boat that takes a max of ten divers in 5 cabins. They usually sail out of Ranong and sail throughout Burma, but since we were there in October it was the shoulder season and they were moving the boat from Phuket to Ranong. They offered a 4 day cruise through the Similan Islands. We were joined by a couple from Denmark (the wife was from Hong Kong) and a couple from Iraq, for a total of 6 divers for the trip. Everyone was very nice and all were great divers. It was nice that although there were a lot of global conflicts going on at the time, this truly international group got along very well. The owner of the boat is Michael, a German who lived in Australia and joined us for the trip but had little contact with us. The leader of the boat is Alain, a Frenchman who is married to Sunan, the cook. We can’t say enough about her wonderful food while we were there. Most of the crew does not speak much English, but Alain and his wife speak English very well. Alain gave all the dive briefings and led most of the dives. Although all of the dives were led, we were allowed a lot of freedom and were able to dive our computer profiles. They were very responsive to any requests and when I asked to slow down during the dive (there were only two of us with cameras) Alain assigned a divemaster to bring up the rear just in case we wanted to separate from the rest of the group and go slower. The accommodations on board were nice and roomy. The boat had just come out of dry dock and everything was working well. The rooms all had double beds and en suite bathrooms which were average size. There were dressers with plenty of outlets (220v, bring plug converter). The master stateroom had a queen bed with a view and was only slightly bigger than the rest. All of the rooms seemed to have good air-con and no reports of leaky roofs despite rain one night. The normal day consisted of getting up at about 6:30am and having tea, fruit and toast. After returning from our first dive, we would have a full breakfast. Thais don’t think of breakfast food like we do and this would usually be noodles or rice. We’re not much for American style breakfast food anyway and by this time looked forward to a bowl of noodles for breakfast. After breakfast we wrote in our logbooks and talked about the fish we saw. After the second dive we had lunch, logged our dived and relaxed. There is a nice sundeck on top and plenty of room on the boat to lie around. Often we would snorkel. The afternoon brought another dive and then dinner. The food was really very good, some of the best food we had in Thailand . 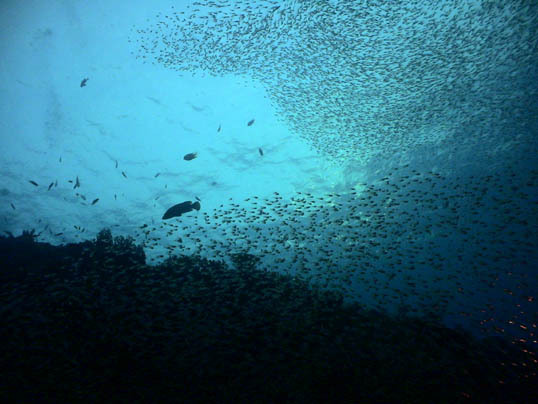 We would finish the day with the night dive. 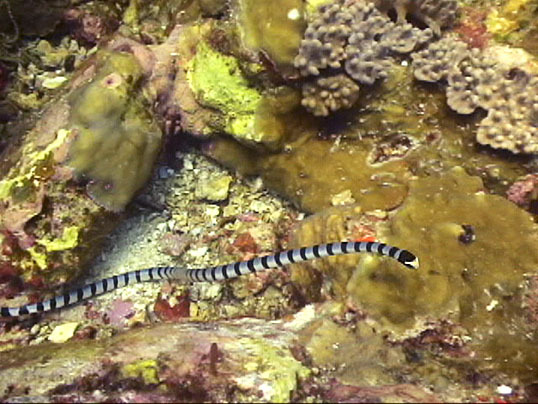 Rather than bore you with dive times and statistics for each dive, we’ll give an overview of the diving and then list the dive sites and a few of the cool critters we saw. We were only diving around the Similan Islands and didn’t get to Thailand’s more famous dives like Richelieu Rock. The diving around the Similans is mostly drift diving and done directly from the back of the boat. Most of the terrain is rocky bommies with hard coral. There is a big dive deck and gearing up was simple. The water temp was 82oF and the vis was 50ft to 100ft depending on the site. We were all given very large safety sausages so when we were finished with the dive, the main boat would spot us and pick us up. Our average dive time was about an hour and our average max depth was about 100ft. and many butterflyfish and anthias that are only found in the Andaman Sea. One of the best parts of the trip was the crew. Everyone was very nice, helpful and polite. They tried very hard to please you even though they spoke little English. 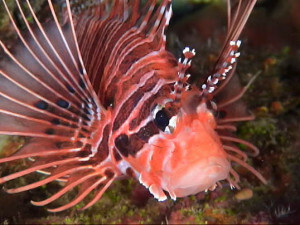 They were also very ecologically conscience and wouldn’t touch the coral or disturb the fish. Alain preached this to the crew which made us very happy. 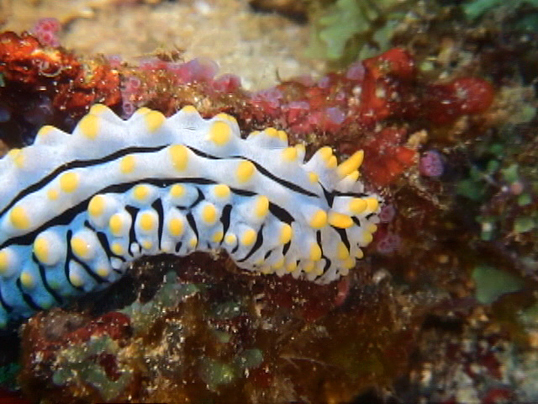 Overall, we would say that the diving in the Similans was good but not superb. The fish population was good but there was not an abundant amount of fish life and coral. 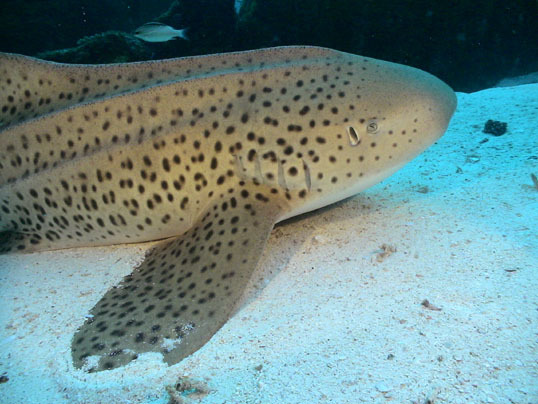 We did see a few leopard sharks and a humphead wrasse, but other than that there were not any large fish. We suspect that the diving around Richelieu Rock and the diving in Burma is better based on what the crew said. When the trip was over, the boat docked at Thap Lamu a little ways north of Phuket. We decided to travel about 30min north to the small resort town of Khao Lak to spend our last 4 days. This was a beautiful, small, intimate village with great food and a great beach. However, this small town was destroyed by the Tsunami in December 2004. Around 5,000 people lost their lives that Sunday morning. More people lost their lives in Khao Lak than anywhere else in Thailand. By comparison, very little damage was done to Phuket. We stayed in a small bungalow right on the beach at the Khao Lak Laguna Resort for only $35 per day. Our support goes out to the people of this community. We hope the village can rebuild and that we can return to Khao Lak Laguna Resort some day. Thanks for reading. Thailand is a special, uniquely foreign and beautiful place and we cannot wait to go back. We would recommend each of the places we stayed and all of the companies that we used.